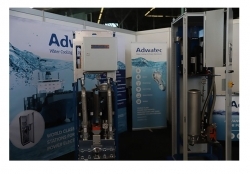 Adwatec, a provider of advanced water-cooling technologies for marine power electronics, debuted a brand-new modular battery and energy storage cooling system at Electric & Hybrid Marine World Expo 2018. The system is able to be equipped with a chiller unit, as well as coolant deionising if required, making it “small, robust, easy to commission, extremely reliable and practically maintenance-free”, according to Ismo Lehtonen, sales and marketing director for Adwatec. Cabinet footprints start from 400 x 600mm and commissioning of the system takes only 30 minutes due to automatic de-aerating. Use of valve block technology minimises the number of fittings in the system. “This, together with the absence of rubber hoses, minimises leakage risk, while long life is ensured thanks to aluminium and stainless-steel surfaces in coolant circulation,” added Lehtonen.